Amid grumblings of a “general fatigue” when it comes to software-based startups, a potentially transformative technology called 3D printing is poised to reach critical mass and mainstream awareness. Today’s news headlines about the technology tend to focus on the extreme possibilities in being able to print objects on demand – from the terrors of things like a homemade 3D-printed gun to heartwarming tales of printed robotic hands for children born without fingers. But the innovation is also powering a revolution of a different kind. An emerging class of creatives are using 3D printing techniques, not to either save or destroy the world and the people in it, but simply to create a little beauty along the way. These creatives, makers of the new “handmade” goods, are selling their art in online storefronts like Etsy and Shapeways, as well as within brick-and-mortar stores, and even museums. They range from technically adept programmers who never dabbled in hands-on art involving paint or clay or other materials, to formally trained artists and even do-it-yourselfers who taught themselves 3D modeling by watching tutorials on YouTube. Regardless of how they got there, the end result is an output of affordably priced, print-on-demand goods that reflect their own unique vision and inspirations, whether that’s a new kind of jewelry that couldn’t exist before the capabilities introduced by 3D printing, one-of-a-kind items used to decorate your home, or objects which buyers help craft themselves, using simple online tools. This is part one of an ongoing series which will showcase some of the art that’s being fueled by the increasingly accessible 3D printing technology, and the artists behind the work. Summer Powell has always been an artist. She has both undergrad and graduate degrees in graphic design, and has worked on a number of products involving mixed media, vacuum forming, and lenticular technology, while exploring the intersection of art and technology in years past. Along with a collaborator, she once produced a clock which used high-resolution animations to tell the time, for example. Powell says she first heard about 3D printing around 10 years ago and had been watching the space ever since waiting for it to become viable for use in her art. “I had industrial designer friends in New York, and I’d go see their prototyping 3D printing machines,” she says. “They were making prototypes of consumer electronics and some furniture.” But it wasn’t until a few years ago before Powell had the opportunity to begin playing around with 3D printing techniques herself. She decided to pay a visit to Silicon Valley-based TechShop, one of the earlier “maker spaces,” as these tool-filled workspaces are called. TechShop, which has since expanded to several cities in California, with plans for New York, D.C., and elsewhere, offers a wide range of professional equipment which members can train on and use for just about any kind of project. It was where Square co-founder Jim McKelvey once built the first three protoypes for the Square card reader, and where a datacenter technology startup called Clustered Systems designed a prototype of a fanless liquid-cooling system which outperformed IBM in a “chill-off” contest. But Powell didn’t want to build gadgets or technological components; she wanted to produce art. “I created a prototype of this idea I had – which I still want to produce – of salt and pepper shakers,” she says. The object is designed to look like a wall socket, if laid flat on a table. The actual shakers then extrude upward from that. “It’s sort of a funny, visual pun,” says Powell. Coming from a background in graphic design, Powell was used to doing a lot of what she describes as “virtual” work. But 3D printing was different. “It was really wonderful to envision an object or a form, and be able to hold it in two weeks time, and actually have a tactile object,” she explains. Today, she thinks of the art of 3D printing as falling somewhere in between the world of graphic design and metal working, another artistic medium she’s practiced in the past, noting the “hands on” nature of the latter tends to be a bit more satisfying of the two. It was about two years ago when Powell begin working on 3D printed jewelry. Her items were first sold to consumers on Etsy, an online marketplace known best for handmade items from DIY crafters, who sell everything from homemade clothing and accessories to watercolor paintings and woven baskets. It’s not, perhaps, the first place you would think to go for items outputted by machines. But Powell’s jewelry fits right in. Still, despite the nature of those early designs, her first clients were often men who were drawn to the jewelry because of its technical underpinnings and geometric patterns, buying them as gifts for girlfriends, wives, and other women they knew. Today, that client base is now starting to shift – around half of the shop’s customers know what 3D printing is, and those who don’t are just interested in buying because of the jewelry’s modern look. Powell declined to discuss her sales saying that her business is still in its “growth stages,” but notes that one of her more popular items is her “Andromeda Necklace” (pictured above). This item is especially interesting because it comes out of the 3D printer with its interlinking, moving parts already hinged together, no assembly required. The necklace, like many of her pieces, is made of a nylon-based material – a material she prefers because of what it can allow for. “There are possibilities beyond what you can achieve in metals sometimes – thinnesses or having one object inside another – there are just all these great possibilities with form with the resin,” she explains. 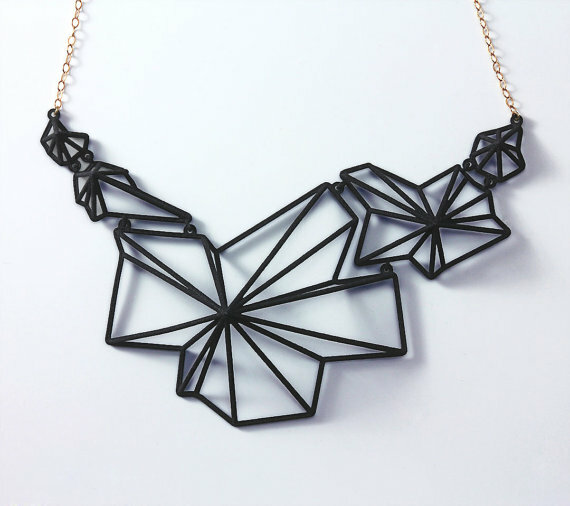 After sending her designs off to a 3D printer following a customer’s order, the turn around time is about two weeks before she gets the items back so she can finish them by adding coatings, clasps or chains. Meanwhile, when inspiration strikes, Powell sometimes still turns to pen and paper to sketch, and other times, she skips straight ahead to the 3D modeling software she uses: Rhino 3D, a CAD program she taught herself to use. Most of the time, Powell designs out of a desk she’s had at a local co-working space, Sandbox Suites for several years, but is planning to expand to a larger space where she can be more physical with the work – not only in assembling the jewelry, but also sculpting objects and then scanning them with a 3D scanner. One that recently caught her eye was the Matterform, which just wrapped up a crowdfunding campaign on Indiegogo to help build an initial batch of scanners. The company was seeking $81,000 but ended up raising nearly half a million in just 35 days. It was the largest non-U.S. fundraise the site had seen to date. Today, Powell sells her designs on her own website, as well in San Francisco Bay area retail stores. Her rep is also bringing her work to showrooms in New York and L.A., as she prepares to expand her business nationwide.